She Treads Softly: They Shoot Horses, Don't They? In McCoy's stunning portrait of poverty and powerlessness during the Great Depression, two struggling young actors risk everything to participate in a dance contest as their last-ditch effort at survival in Hollywood. When a dance marathon craze sweeps the country, Hollywood film extras Robert and Gloria join dozens of other desperate young men and women to compete in a multi-day, dance-till-you-drop spectacle. Most dancers are hoping to get noticed by major movie studios. But as live audiences cheer and jeer, bodies drop, fists are thrown, and the trendy contest quickly becomes a cutthroat nightmare for its participants. They Shoot Horses, Don't They? stands next to The Grapes of Wrath as one of the most convincing-and heartbreaking-fictional portraits of America during the Great Depression. It was also made into a classic film starring Jane Fonda and directed by Sydney Pollack. This ebook features an extended biography of Horace McCoy. 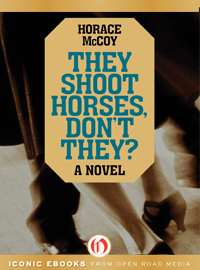 Many people are probably familiar with the Academy Award-nominated movie based on Horace McCoy's novel, They Shoot Horses, Don't They? Those who are not familiar with either should do themselves a favor and read the book. Toward that end, Open Road Media has reissued an e-edition of McCoy's novel. They Shoot Horses, Don't They? follows Robert Syverten and Gloria Beatty as they compete in a marathon dance competition held at a ballroom over looking the Pacific on the Santa Monica Pier. While they entered as a couple, they are not a couple in the sense of committed partners. They are just a couple of down-and-out young people who want to make it in the movie industry but so far have only achieved rejections. After meeting they decide to enter the marathon dance competition as partners. Helping create a real sense of foreboding is the fact that we know, right from the opening, that Robert kills Gloria. He confesses that he killed her. At the beginning of each chapter is a short excerpt from the judge sentencing Robert for the murder of Gloria. But as the reader follows their relationship, we know that Gloria has a fatal outlook on life and often repeats that she wishes she were dead. Since the novel was published in 1935, it really showcases a slice of American life from that time period. It captures the economic poverty experienced by citizens during the Great Depression. They entered the contest simply to enjoy the free food as much as they want to win the $1000 prize. Most people will understand the implications of the title of They Shoot Horses, Don't They? The desperation the contestants must feel to expose themselves to the brutal contests and excruciating physical pace required by the marathon are well portrayed. This is not a long novel, but it is well worth your time, especially if you appreciate novels that capture a time period in history. Some books will always be considered classics for a good reason. They Shoot Horses, Don't They? is very highly recommended. Open Road is releasing this classic as well as McCoy's classic noir, Kiss Tomorrow Goodbye. Disclosure: My Kindle edition was courtesy of Open Road and Netgalley for review purposes. I've never read this, although the title is so familiar I think it must have been on my parents' bookshelves. Sounds like it's about time.